Want to be part of launching the next new Young Adult Paranormal Thriller series by an award-winning author? Get in on the ground floor and pre-order Ghost Hand on my Kickstarter Project. With only four days left, I have already reached my $2500 goal and I am now working toward a stretch goal to fund travel to the location of Ghost Hand book 2, exotic Indianapolis, Indiana. WHAT ARE PEOPLE SAYING ABOUT GHOST HAND? “As an adult reading GHOST HAND, I was struck by how much I wanted to be Olivia Black. Ripley Patton’s passion for teens and skill at writing is revealed in Olivia’s sassy, smart personality.” – Angel McCoy, Editor of Wily Writers Audible Fiction and horror writer extraordinaire. “She’s done with that thing? Does this mean I get her lap back?” – Jet, the Patton family cat. “Ripley Patton knows how to deliver a coming-of-age story packed with realistic, rounded characters.” – Edwina Harvey, Editor of Andromeda Spaceways Inflight Magazine, Freelance editor, and author of the YA science fiction novel, The Whale’s Tale. WHAT IS GHOST HAND ABOUT? There are secrets we keep hidden deep inside of us. Secrets of abuse and abandonment and self-harm. No one can see them. No one can find them. No one can touch us there. Olivia Black just discovered that her ghost hand, a genetic defect, can do more than light up a room. It can reach into people and pull things out. Things from the darkest depths of the human psyche never meant to exist in this world. Olivia can pickpocket the soul. But she can’t control her ability, or the strange items it extracts, and the only thing between Olivia and the men bent on taking the power of her hand is a boy she barely knows and doesn’t trust. 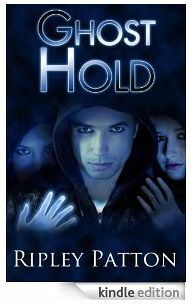 Ghost Hand will have a release date of November 2012, just in time for the Christmas season. You can listen to the first chapter of Ghost Hand on StarShipSofa, read by Ripley herself. Then go check it out on Kickstarter and pre-order your copy by backing the project today. Congratulations, Ripley, that is tremendous news. Good luck with the ‘extension’ project too. Congratulations! Good luck moving forwards. Btw, do you know the ‘Sister of the Benevolent Gods’ link is broken since cosmass shut down? I think I have a copy of the .mp3 if you don’t have one, so you could host it locally.